Replacing nutrients the body normally secretes can disrupt natural body processes, creating an imbalance in the body and causing dependence, similar to the wasting away of muscles if they are unused. Other concerns about supplemental, manufactured glucosamine include shellfish allergy, contamination, ecological harm, insulin resistance, effectiveness and possible adverse effects. 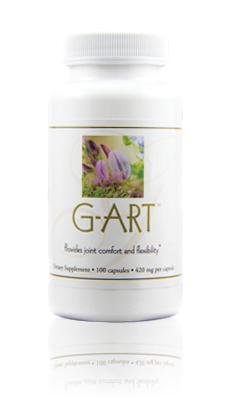 Unlike manufactured glucosamine, G-ART harnesses the body’s natural ability to secrete glucosamine. It nourishes the body with a unique formulation of wholesome plant foods to stimulate glucosamine production. Glucosamine is an amino sugar produced naturally by the body from glucose (a sugar) and glutamine (an amino acid). Glucosamine is then used to produce glycosaminoglycans, which are major components of cartilage. Glucosamine, which does not exist on its own in nature, also helps to normalize cartilage metabolism, and reduce joint pain and inflammation. Manufacturers extract it from chitin in the shells of shellfish, from bovine or shark cartilage or make it in laboratories. As the body ages, it needs more antioxidants to help maintain healthy cell regeneration. A plant-based diet rich in glutamine and antioxidants provides the body with material to stimulate glucosamine production and help renew joint cartilage. The human body may need more glutamine than usual in cases of heavy exercise, infection, surgery, and trauma, such as burn injuries. Vegetarians especially need a plant-based source for glutamine. Good plant sources of glutamine include brown algae, parsley and spinach. However, cooking destroys glutamine in vegetables.G-ART is made from wholesome brown algae, ginger, alfalfa, parsley, acerola cherry, spinach and cactus. For children, G-ART stimulates production of glucosamine, which is important for children’s healthy bone and joint growth so they can grow tall. The science of Nutritional Immunology advocates eating plant foods rich in glutamine, manganese and antioxidants to stimulate the human body’s natural production of glucosamine. In addition to plant foods rich in glutamine, we also include plant foods rich in manganese and antioxidants to stimulate the human body’s natural production of glucosamine. These nutrients help balance immune function, reduce inflammation (necessary for healthy joints), enhance joint regeneration and promote healthy joints. G-ART is suitable for vegetarians and people who are allergic to shellfish. Q What are the functions of glucosamine in the body? Glucosamine is essential for healthy joints and bones. Cartilage and other body tissues use it as a building block. Glucosamine also helps to normalize cartilage metabolism, and reduce joint pain and inflammation. Q How can we stimulate the body’s production of glucosamine naturally? As the body ages, it needs more antioxidants to help maintain healthy cell regeneration. A plant-based diet rich in glutamine and antioxidants provides the body with material to stimulate glucosamine production and help renew joint cartilage. Glutamine is a naturally occurring amino acid (a building block of protein) in the human body. It is needed by the body to produce glucosamine. Glutamine aids cartilage production, immune function and healing. It is important for the body’s chemical processes and is a major fuel for the body. Glutamine also promotes gastrointestinal health. Q What is Nutritional Immunology’s take on glucosamine supplementation? 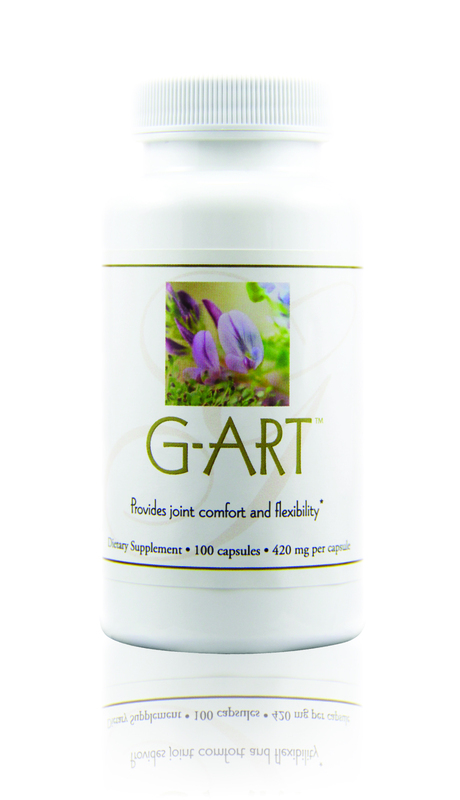 G-ART supports joint and bone health. Unlike manufactured glucosamine, G-ART helps to stimulate the body’s natural secretion of glucosamine with wholesome plant foods. The ingredients—brown algae, ginger, alfalfa, parsley, acerola cherry, spinach and cactus—are rich in nutrients including glutamine, manganese, chlorophyll, phytoestrogens, vitamin K, antioxidants, phytochemicals and polysaccharides. These nutrients help balance immune function, reduce inflammation (necessary for healthy joints), enhance joint regeneration and promote healthy joints. G-ART is suitable for vegans, vegetarians and people who are allergic to shellfish. Q What is unique about G-ART? Replacing nutrients supposed to be secreted by the body can disrupt natural body processes, create imbalance in the body and cause dependence, just like how muscles waste away if they are unused. Other concerns about manufactured glucosamine include shellfish allergy, contamination, ecological harm, insulin resistance, effectiveness and possible adverse effects. Unlike manufactured glucosamine, G-ART harnesses the body’s natural ability to secrete glucosamine. It nourishes the body with a unique formulation of wholesome plant foods to stimulate glucosamine production.